Another day of sun means another day of shorts! 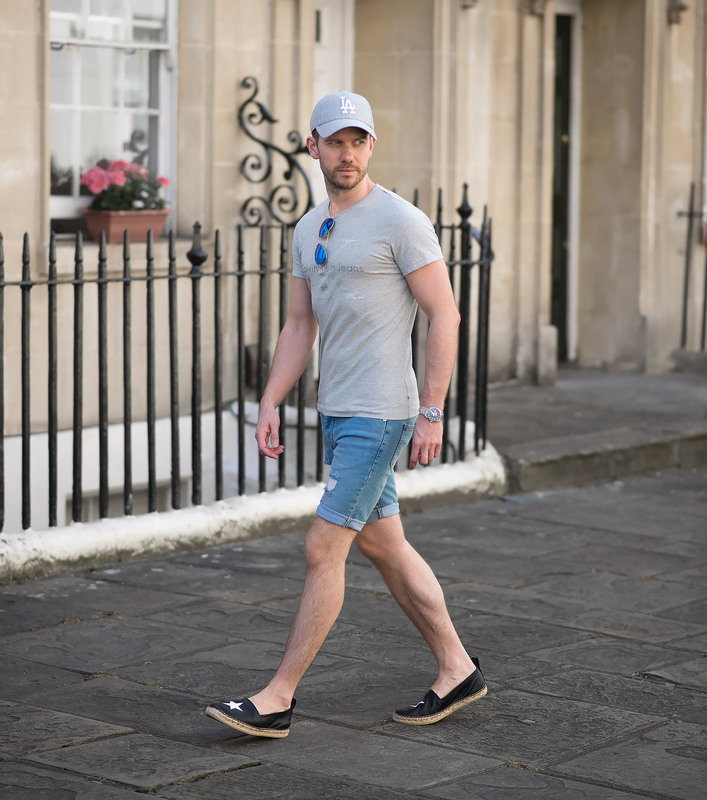 Following on from my chino shorts outfit post in which I wore one of my trusted pair of chinos, this time I chose something a little different to combat that heat wave descending upon us. 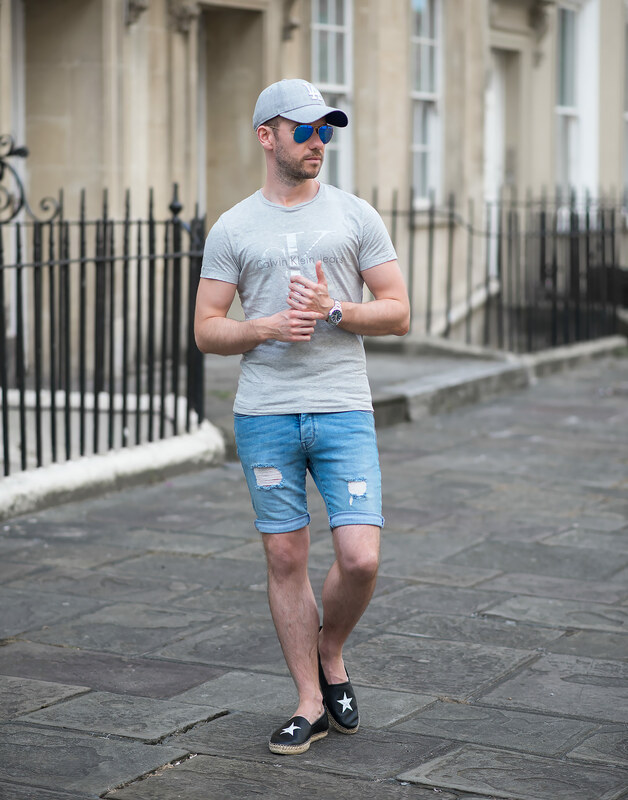 For this outfit I chose a pair Topman Skinny Fit Denim Shorts … but in rigid denim! Quite a dramatic shock to the system now my legs have been pampered with super soft and stretchy premium women’s jeans. But when it comes to shorts, there is very little to chose from except for the typical gigantic ill-fitting affairs. Women’s shorts are of course a big no-no due to how short and tight they usually are! I headed to the high street to see what was available with Topman my first point of call. To my surprise they stocked a fairly large range of skinny denim shorts, some actually had admirable washes considering their cheaper price point. Many could even be considered worthy opponents against designer denim – a big shock! One pair stood out from its brothers – The Topman Blue Ripped Stretch Skinny Denim Shorts. The wash is a medium to light blue with an ample amount of distressing, large ripped hole in one leg and a variety of worn areas in all the typical places (coin pocket, rear pockets and hems). I opted for my usual size of a 30 which delivered a great fit! Nice and snug without the side effect of cutting of the oxygen to my legs! The hem as standard reached just above my knees and the rise is of a medium length (you rarely even see low rise denim anymore). The more astute of you can tell from the accompanying photos that I did purchase these shorts! 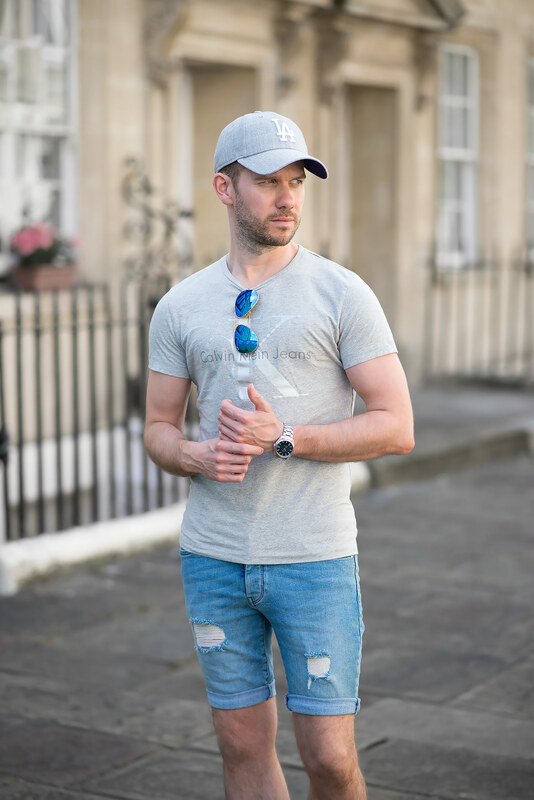 I teamed up this new acquisition with a Calvin Klein Reflective Logo T Shirt in a light grey marl featuring their classic logo across the chest, but in a muted off white colour (which has a touch of sparkle when looking close). 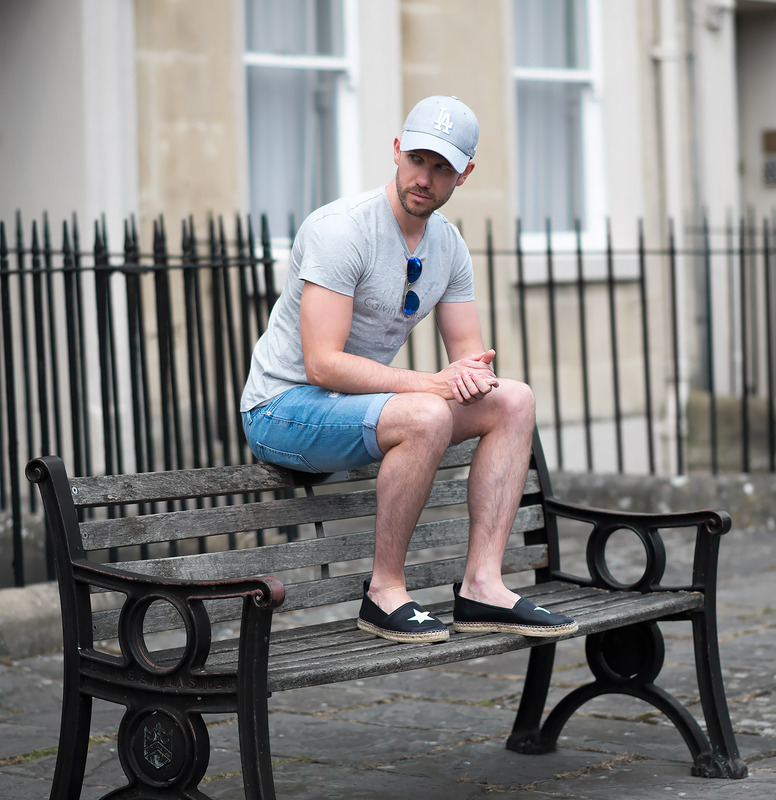 For the rest of the outfit I picked my Givenchy Star Embossed Leather Espadrilles which I reviewed previously and a grey cap (purchased on the day of the shoot, popped into Topshop and was greeted with a wonderful textured grey New Era NY Cap with the logo in a padded white). Of course as it was a bright sunny day, I came armed with a pair of trusty Ray-Ban Aviators with reflective blue lenses. Another day, another outfit post on my mens fashion blog. 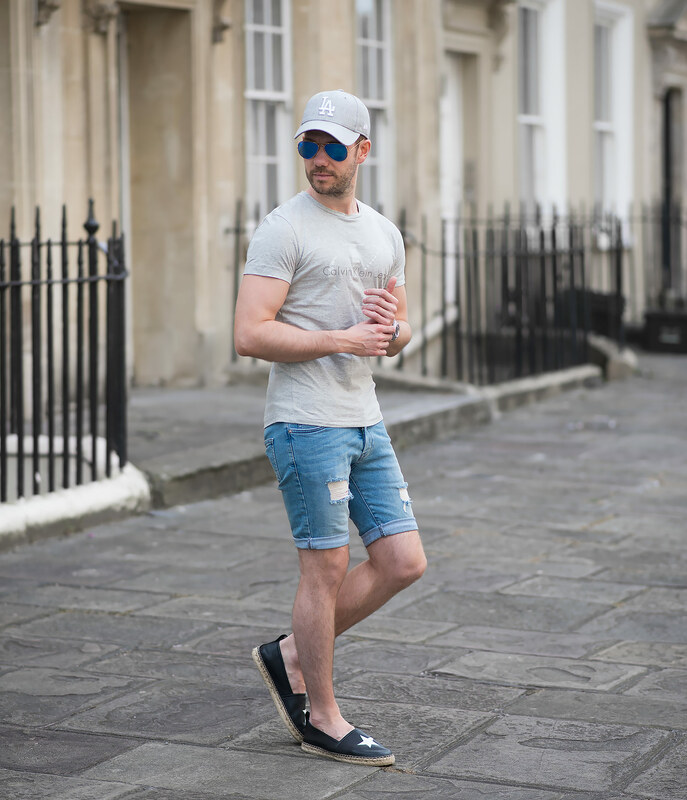 Please let me know in the comments below what you think of the skinny denim shorts! Thank you Michael! Glad you like it!